Are you in the market for vinyl awnings but are not entirely sure if it is the right choice for your door and window treatment? How do they compare with other materials available in the market? These are good questions especially if you have no idea what to look out for in choosing the right outdoor awnings. In this post, we will take a good look at vinyl awnings and what they have to offer. Only then can you decide if these canopies make a good fit for your home. Why choose a vinyl waterproof awning material? Vinyl is plastic resin and a type of material that mimics the appearance of leather (faux leather). As a choice of material, vinyl is inexpensive and safe to use which is why it is extensively used in a wide range of home improvement products. They also come in various textures, colours and patterns which makes it easy to work with regards to home aesthetics. Unlike typical canvas patio awnings in Australia, vinyl fabric is sturdy, moisture resistant and easy to keep clean — qualities that make it an excellent choice of material for door and window awnings. Vinyl awnings are not just trendy but highly functional as well. These shelters can secure your home from the harsh elements. They can protect your home far better given that these are moisture-resistant and will help keep your furnishings from fading and wearing out. Vinyl awnings are likewise capable of maintaining ideal temperature levels inside your home which will help lower your cooling and heating expenses. 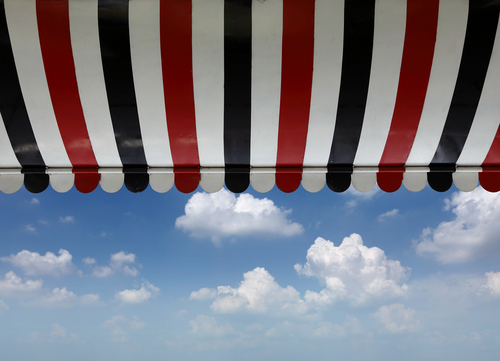 Minimal upkeep — there are plenty of other options for fixed or retractable awning fabric . Nevertheless, maintaining them is similarly important as buying it. Vinyl awnings are easy to clean and will last for a long time with occasional cleaning. Looking to get started with some of the best deals on vinyl awning fabric near you? We have what you need here at Shutters Australia! Check out our selections of quality awnings online or phone us today on 1300 853 206 for any questions or concerns.